The tourist is required to show the purchased goods, VAT Refund Applications (P.P.10), and original tax invoices to the Customs officer at the airport to obtain a Customs stamp and signature at the lower right-hand corner of P.P.10. 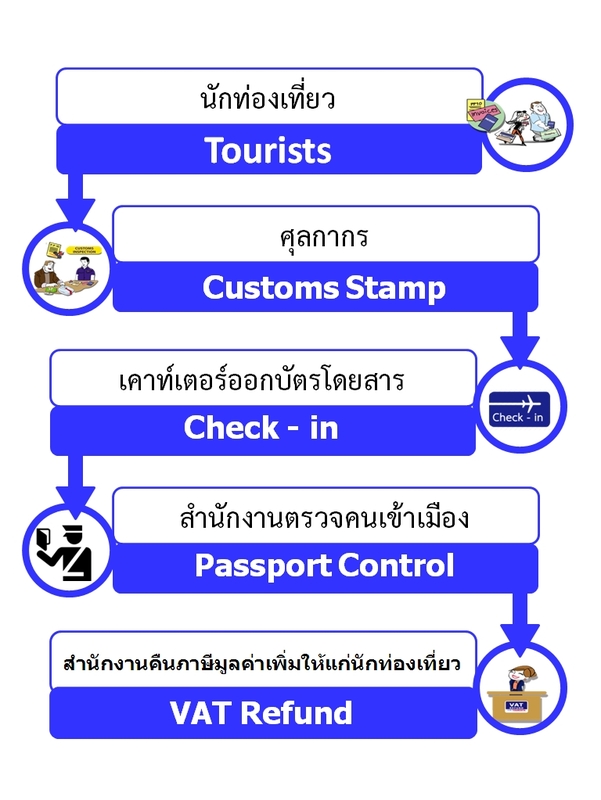 In case of luxury goods (jewelry, gold, ornaments, watches, glasses, and pens of which the value is over 10,000 baht), the tourist is required to hand carry and show the goods again at the VAT Refund for Tourists Office, after passing the immigration checkpoint. Check-in at the airline counter. Go through the immigration checkpoint. Submit P.P.10 and show luxury goods (if any) to the VAT Refund for Tourists Office for a VAT refund.